Soup’s been on the menu quite a bit this week. Maybe it’s because of the change of the seasons. Maybe because it can be a complete meal contained in a bowl. Maybe just because it’s delicious. In Japanese culture, udon noodles are served chilled in summer and hot in winter. There’s starting to be a nip in the air come evening, so creating a hot soup was a no-brainer, though during the day, summer’s been reminding us here that it’s not done until Monday. 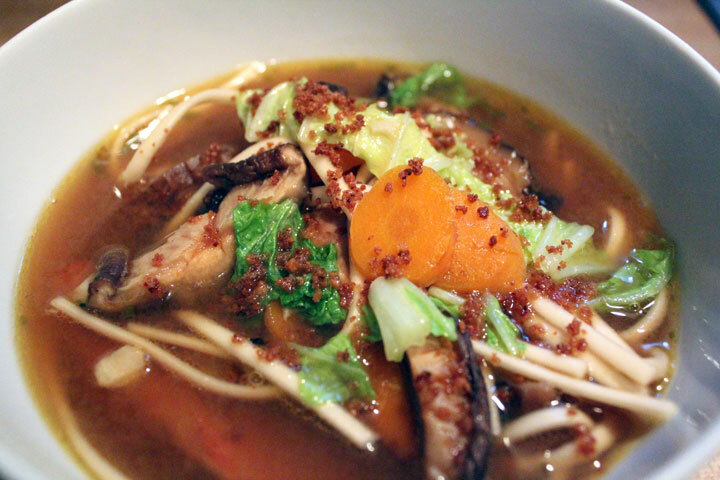 We paired our soup with what could be considered an interesting choice — Curtis Winery 2011 Heritage Cuvée. However, Rhone blends are very versatile when it comes to pairing, and this was excellent with the meal, picking up the earthy flavors of the shitakes and Tamari while highlighting the caramelized sweetness of the carrots. It made for a hearty supper and a lovely glass of wine. In a large skillet or stove top wok, heat the sesame oil over high heat. Add the pork and pinch of salt, letting each side cook until browned, usually about three minutes per side. Remove pork and set aside. Toss in carrots and sugar and stir until carrots have caramelized. Remove carrots and set aside. Throw in the Panko. You may need a bit more oil. Stir crumbs until they turn golden-brown. Drain on a paper towel. Turn heat down to medium and place ginger, garlic, and chives in the skillet. Stir until the aromas are released, then pour in stock. Toss in the mushrooms, and pour in the Tamari. Add pork and carrots and let simmer 30-45 minutes. Add noodles and cook another six minutes. Add cabbage and cook two minutes more. Place in bowls. Add sriracha if wanted and sprinkle with crunchy Panko.